I still can't believe this happened to me. 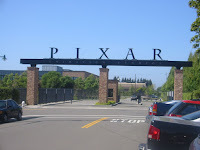 This is my story of how I got a personal tour of Pixar, and attended a private screening for the Pixar employees of a film I worked on. A couple years ago I began collaborating with Michael Verrechia and Lincoln Ruchti on the film "Chasing Ghosts". I was to create several computer animated segments to embellish the film. Fast forward to January 2007, the completed film had its worldwide premiere at the extremely prestigious Sundance Film Festival. You can see my previous posts about the movie here if you need some more back story. Unknown to us at the time, sitting in the audience at one of the Sundance screenings was Andrew Stanton, the Pixar director of "Finding Nemo". About a month after Sundance, Michael called me and told me that Pixar was interested in having a private screening of Chasing Ghosts. They were going to fly us all out there and screen the movie at their Emeryville, California campus. Wow. We later found out that Andrew Stanton had seen the movie at Sundance, ran out and grabbed his wife and dragged her into the movie saying "you've gotta see this movie!". Andrew told us he was so enthused about Chasing Ghosts that he wanted to show it for the Pixar employees. Apparently Pixar has a program called Pixar University that encourages bringing in outside films to show for the employees. We already had plans to attend the Los Angeles Film Festival for another screening of Chasing Ghosts so it worked out that while we were in LA, they would just fly us up to to the Emeryville for the screening. So, first thing June 21, Michael, Lincoln, and I traveled to LAX airport and caught the 1 hour flight up to Emeryville. There was a limo waiting for us at the airport. My last name was on a piece of paper in the window of the car, which I thought was pretty freaking sweet, but the driver told us he just wrote the longest name since it was most unique. Oh well. Still darn cool. Here's a photo of my name in the limo. The front gate to Pixar is pretty impressive. I didn't think to take a photo of it as we drove up, but I found a nice picture on the web that I was given permission to use, courtesy of David Lewis at http://www.wilygraphics.com. Thanks David! Here's us looking pretty stupified after the limo dropped us off at the "front" of the building. The entrance was WAY down towards the middle of the building, and we were dropped off at the end of the building. Kind of weird to be just standing there on the Pixar campus and nobody around. Ding! Time for a photo op! We got these cool visitor badges. Anyone who has seen Toy Story will get the cute reference at the bottom. The campus building has a large, open, center section. There are Pixar artifacts everywhere - artwork, figurines, etc. Off to the left is a cafeteria for the employees. Across from that a meeting area, and even a room where you can fix yourself some breakfast cereal. It looked like the cereal room only existed for the purpose of fixing yourself a bowl of cereal any time you wanted. Our visit was one week before the opening of Pixar's "Ratatouille", so most of the campus was decorated with Ratatouille artwork. 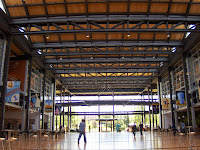 At the far end of the atrium was the Pixar Theater. This is where they do their dailies, etc., and it was where we were going to be showing Chasing Ghosts. Here's some photos of the atrium from the other side. We were met at the front desk by Brett Pulliam, one of Pixar's character animators. Brett is a fellow arcade game collector (! ), so he and I had actually been coresponding for a month or so via email. Brett was to spend the day showing us around, and he had kindly arranged for us to see a private "friends & family" screening of Ratatouille (a week before it opened!) later in the day! 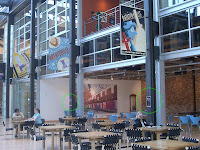 Glancing around the atrium a little more and we notice - it's a Chasing Ghosts poster at Pixar! In fact, they had Chasing Ghosts posters all over the place (circled). 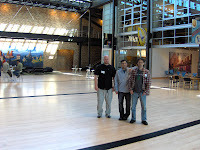 Here's a picture of us standing like goofs in the Pixar lobby. The Pixar theater was amazing. I wish I had taken some photos. You can catch glimpses of it on some of the "making-of" DVD extras on certain Pixar movies. It looks like it seats around 600 people. Very plush and comfortable. When the lights go down the entire ceiling is covered in an illuminated starfield (complete with the occasional shooting star) and all you hear are cricket noises. While watching our movie and Ratatouille later in the day I was blown away by the sound system the theater has. Very impressive. So the theater was basically packed for our screening. We had a really good turnout. It was really heartening to see so many enthusiastic Pixar folks sitting there to watch our movie. Before our movie began, Andrew Stanton introduced the movie to the Pixar employees, telling the story of how he saw it at Sundance and REALLY got a kick out of it. Then he introduced Lincoln, Michael, and me and we went up front to thank Pixar for inviting us. Then the movie began! I had seen numerous screenings of the film at Sundance, and the thing I was most struck with watching it there amongst the audience of Pixar employees was the audience reaction. It was priceless. Every single spot in the film where there should have been an audience reaction, there was one. People were laughing, chuckling, sympathetically saying "awww...", all at the right spots. It was, well...priceless. Like I said. People reacted really well at the Sundance screenings, but nothing like the Pixar audience. This was clearly our target audience. After lunch, Brett began our tour of the Pixar facility. All the areas beyond the main atrium were all "closed sets", meaning no photographs. The first stop on our tour was Brett's office. 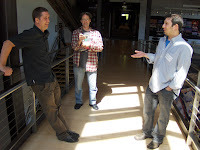 As I said, Brett is a character animator who told us he had been with Pixar for about 10 years. I imagine he's been there for every Pixar movie. His office could have easily been my own - arcade video game (Bubbles) sitting in the corner, Dragon's Lair (or maybe it was Space Ace) poster, shelves full of pop-culture toys and action figures. He had a computer workstation in another corner, and had a scene from Ratatouille that he had animated cued up. It was a scene from the trailer that had the character Skinner trying to hit the rat Remy with a broom. Brett had animated Remy jumping out of the path of the broom for that scene. In the scene was just a low-resolution Remy model and simplified models for the two kitchen tables that Remy was to jump across. Nothing else in the scene. Looked like the computer was running some form of Linux OS. The animation and timeline tools looked SO nice to me. Looked like a dream to use. He intentionally messed up a couple things about the animation to give us a feel for how the animations were done, then rendered out a draft render of the scene with the other characters and scene elements in place, complete with lighting and color. I think the draft render of the animation took about 45 seconds to a minute. The scene was about 1 second long. I'm guessing the draft was all done on the render farm over the network. I wasn't actually sure if ANY of the work Brett did was hosted locally on his machine or of it was all host-based with each artist working out of a private sandbox. Needless to say, I could have sat there all day and geeked out at Brett's workstation. We soon moved on to the rest of the tour. The campus reminded me of a sort of shrunken Disneyland. Each person's workstation would be an attraction ride, and each section of the campus would have a particular theme, like Disneyland has. While I was not allowed to take photos, I found some photos on the site aintitcool.com and have respectfully borrowed them to use here since the page where I found them is currently not working. The infamous Pixar render farm. If you've watched the DVD extras for Finding Nemo (I think that's the one), you'll see a scene where the Pixar employees have a paper airplane contest and all throw their planes from a large catwalk that runs from one side of the open atrium to the other. It was cool walking across that catwalk since I had remembered seeing it in the DVD extras. Lincoln and I took pictures of each other on the catwalk as Michael chatted with Brett. Looking at the pictures now, I guess we weren't really supposed to be taking photos there, but I guess it was okay since we were technically in the atrium. We didn't even think about it at the time. Oopsie. This HUGE painting of Remy the rat from Ratatouille was on display in the atrium, so I was allowed to take a photo of it. Glorious. Brett then swung us past the Pixar render farm. I felt like we needed to talk in hushed, respectful tones. It was actually smaller than I would have imagined, but I was impressed all the same. The area was very dark and unlit. I don't remember hearing any noise except the sound of air blowers. You can see a photo of the render farm above amongst the Aint It Cool pictures. The tour then led outside. There is a campus pool and a basketball court on the grounds. 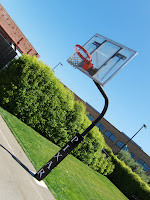 Even the basketball courts were adorned with Pixar branding. We then headed off the campus and walked a block to a small restaurant where Brett was meeting a buddy of his who was also going to be attending the Ratatouille Friends & Family screening. We ate and chatted for a while, then headed back for the Ratatouille screening! It was beginning to get dark out by the time we got back to the Pixar atrium. Crowds of people were everywhere on the campus both inside and outside. Some were outside throwing Frisbees, some where having beer bashes. Some were walking around eating bowls of cereal (see above description of the campus). We eventually got in line with our tickets. There were signs posted at the entrance to the theater stating that NO electronic devices would be allowed inside the theater. They were even collecting cell-phones at the entrance, and were "wanding" every person as they entered the theater. Remember, this was a week before the official movie release. I won't even go into reviewing Ratatouille. I'm sure if you're interested in the movie, you've seen it yourself by now. The entire movie was actually sort of a blur to me. Watching a pre-premeire screening of a highly anticipated Pixar film, right there on the Pixar campus. It was too much for my small little brain. Brett then took us to our hotel where Pixar had put us up for the night. We spent some time chatting and eating in the hotel restaurant. Then Brett left and we headed off for a good-night's rest. I can't remember what I dreamt about that night, but it wouldn't have mattered. I had been dreaming all day, and I'll never forget it. As an aspiring animator/modeler trying to break into the field, my trip to Pixar was beyond my wildest dreams. Thanks again to all the people at Pixar that made this happen, the people who I chatted with, and the people came to see our movie. That sounds like it was a great time. thanks for posting it and the pictures. I am looking forward to getting to see Chasing Ghosts sometime too. How will us non-festival types get out hands on it? Thanks!